You know how sometimes when you are having a good time and someone mentions something about doing something similar and you are like - "yeah, that will be great" because you are having a great time when you said that and then you wonder why you ever said that? Well, that's what happened to me and Barbara back in February when we said yes to a 5 day pelagic birding trip in San Diego. It sounded like fun but we have never done anything like this before so we've been a little nervous. The trip is aboard a boat called "The Searcher" and leaves out of San Diego. We will spend 4 nights and days aboard looking for sea birds in the Pacific ocean. The reason that we got all caught up in it is because there are 13 people from the east coast going on the trip who we know either from DVOC or other pelagic trips. The trip started on Friday with some land birding over Labor Day Weekend around San Diego. We don't actually get on the boat until Monday at noon. 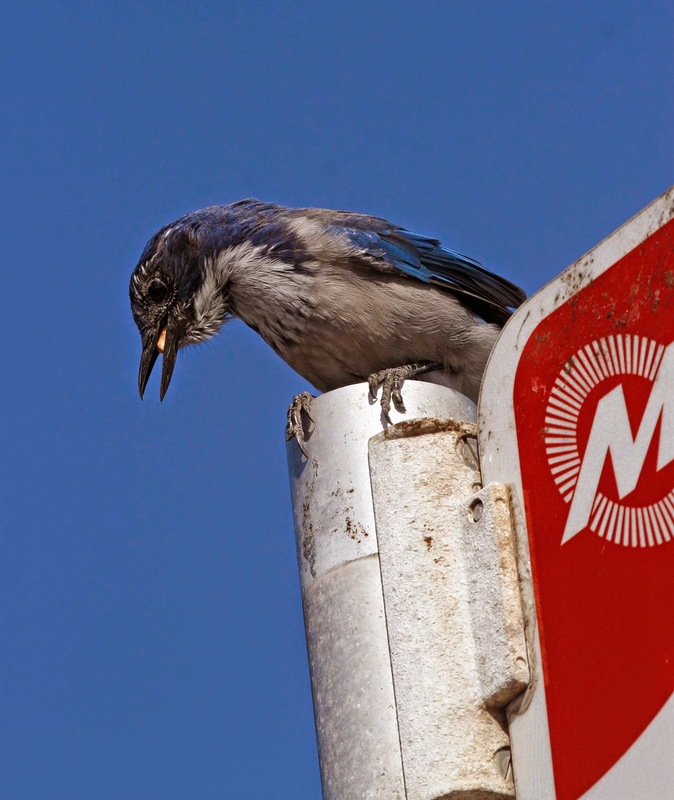 I thought I would give you something to read while I'm at sea starting with this compilation of birds perched on man-made objects. After checking in to our hotel, the East Coast group went out to Point Loma for some local birding. 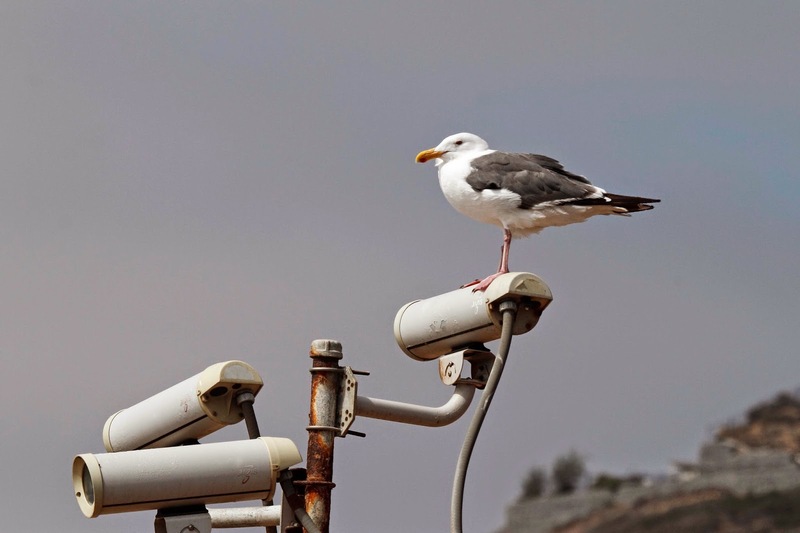 Our first bird was Western Gull - perched on the security cameras. The cameras are there because the whole Point is really a naval base with a little bit of National Monument mixed in. 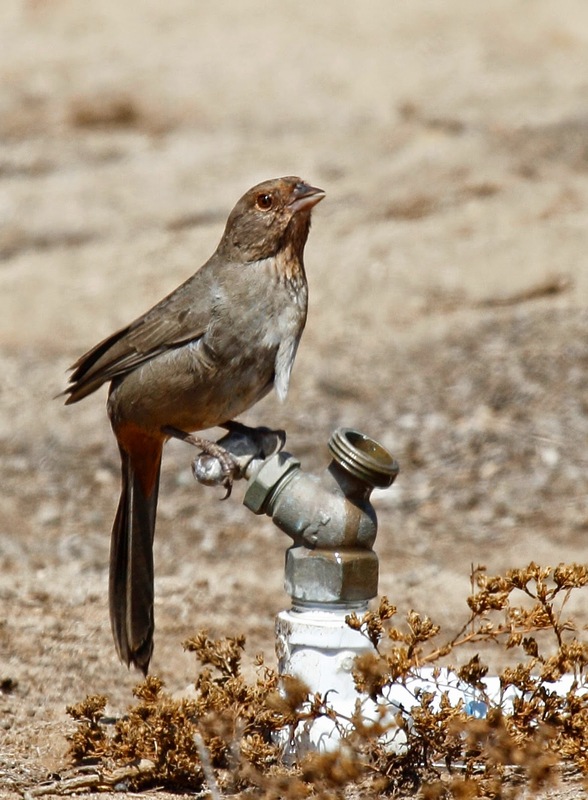 Another very common bird in California is this California Towhee. This one was getting a drivnk from a spigot. Western Scrub Jays are also common. This one is waiting for the bus to pick him up. Only kidding. These birds did wait for the bus but not for a ride. They waited at the bus stop and went crazy when the bus driver threw a bunch of peanuts or something out the door. 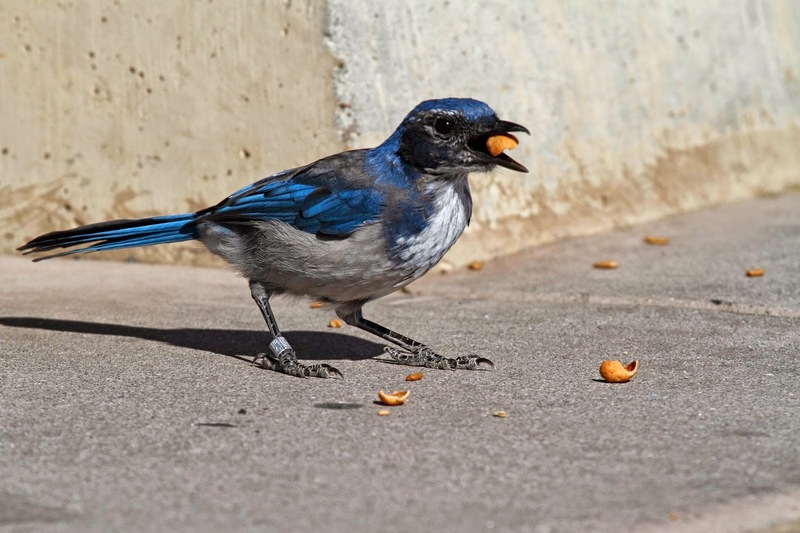 Here is a happy bird gobbling up nuts. The East Coast gang is made up of some VERY seasoned birders. These people have already seen a ton of birds. These birders are also "listers" which means that they are VERY interested in seeing as many birds in the US as possible. Some of these birds are "countable" even if they aren't really US birds. Some of them wander into the US and get counted. Others, like this next bird are not US birds but you have probably seen them even if you aren't a birder - at pet stores all across the country. They are countable because they escaped and now live in the wild. 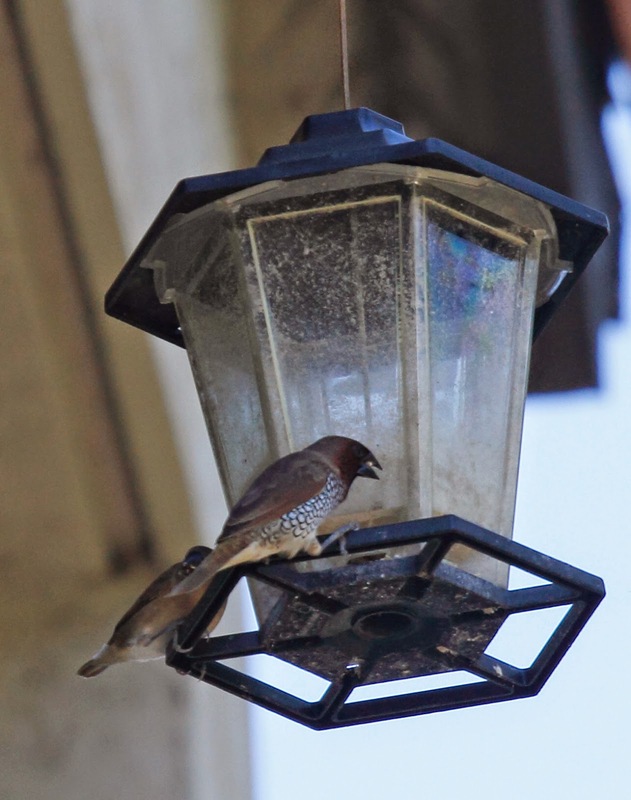 Here is Scaly-breasted Munia. 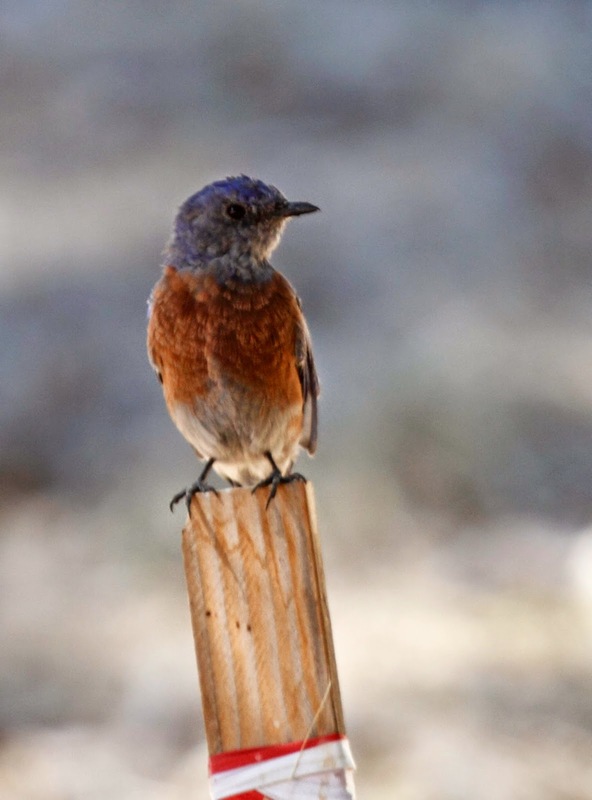 A Western Bluebird perched on this sign post at Cayumanga State Park. I'll tell you all about our trek to the Laguna Mountains later. 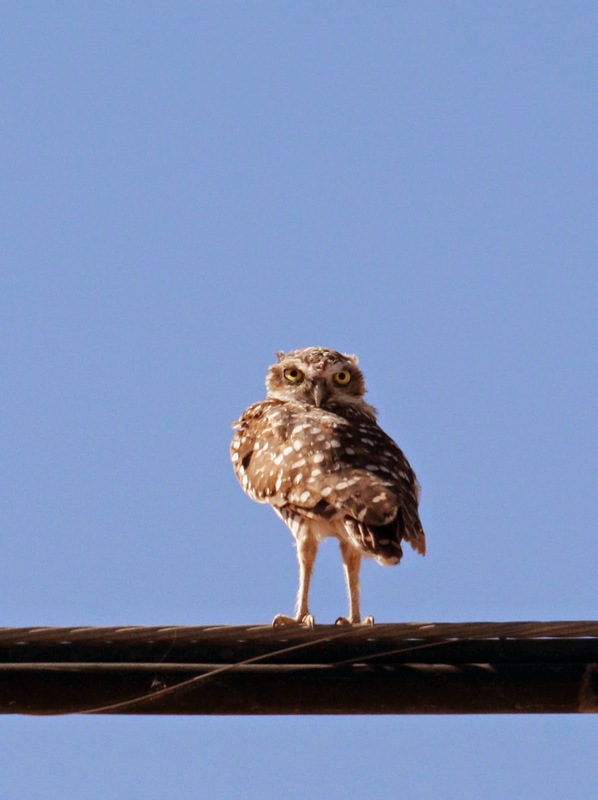 Burrowing Owls live on the ground. They nest in burrows. What is this owl doing on a power line? Who knows. This photo was taken out by the Salton Sea. More about that later. Ash-throated Flycatcher was the last bird that Patty and I saw for the Stupid Contest last year. They are very rare in NJ but fairly common in California. 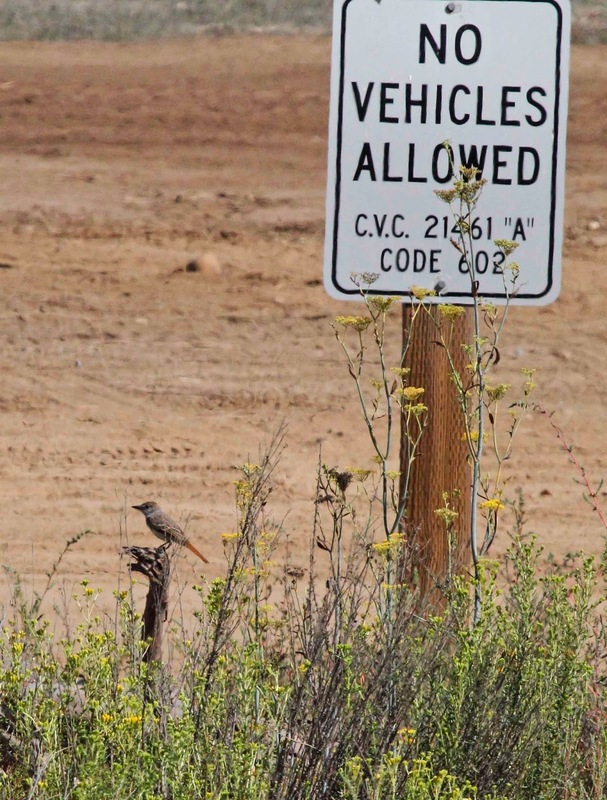 Here is one on the lookout for illegal vehicles.